St. Mary’s University’s Department of English and Communications Studies will unveil its literary magazine, Pecan Grove Review XVII, at The Twig Book Shop on Wednesday, Nov. 16. 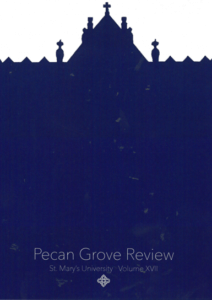 The Pecan Grove Review now offers St. Mary’s alumni the opportunity to submit their written works. Including former students offers them the chance to continue fostering their creativity and to reconnect with their alma mater. The 6 p.m. event is free and open to the public. Students, faculty, staff and alumni will read their submissions from the newest edition of the magazine, originally released in 1993. Refreshments will be served. The student-produced Pecan Grove Review is under the leadership of faculty adviser Refugio “Ito” Romo, Ph.D., Associate Professor of English and Communication Studies. Students, faculty, staff, and alumni submit pieces to the magazine for consideration of publication.